Open /usr/local/etc/snmpd.conf and set up the community and network access. Click here to download an example configuration file. 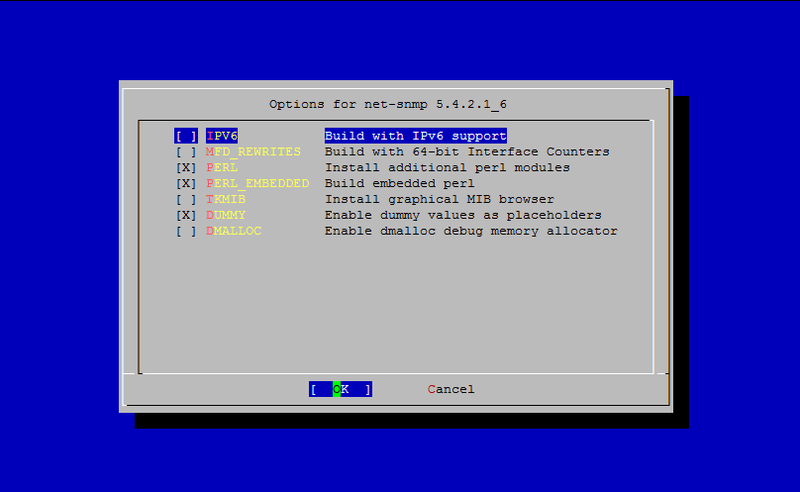 This will get you up and running with a basic snmp configuration. Next, we'll use snmpconf utility to set up an advanced configration. The next step is optional. There is a handy utility called 'snmpconf' that can be run to help you generate the snmp.conf (optional) and snmpd.conf files. This will give you more options and help you with the security. snmp.conf dictates how Net-SNMP applications should operate, snmptrapd.conf configures the snmptrapd daemon which is used for ongoing monitoring via SNMP, and snmpd.conf defines how the snmp daemon which we will be using, is configured. Choose option '1', and at the 'System Information Setup' menu, choose '1' again. You will be asked to enter the location of your system. This can be the country, locality, site name, or any other data you would use to describe the location of the system. After you enter this, you will be returned to the 'System Information Setup' menu. Choose option '2' and enter the contact information for the administrator of the machine. Finally, when you choose option '3', you will be asked a number of "Yes/No" questions to determine what the proper value for the sysServices object. This is used to determine what services your machine offers. Reply with a '1' for yes, or '0' for no. When you are done with the 'System Information Setup' menu, type 'finished' to return to the main menu. For the purpose of simplicity, we will set up a read-only SNMPv1 server which listens only on localhost. 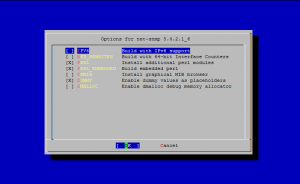 SNMPv2 and v3 provide some added security in the form of user names and passwords. To continue, choose option '3'. You will be asked to enter a community name for read-only access. This can be any one-word string you wish (for example pub), and is simply used as a weak method of authentication to restrict access to the service. Then choose 'localhost' as the hostname from which to accept that community string, and press ENTER for no-restrictions on what the user of that community string can read. Choose option '4', and enter 127.0.0.1 as the address at which snmpd will listen. Return to the main menu, and choose 'finished' again. You will be shown to the original menu asking which file you would like to edit. choose to 'quit'.